3 August 2016 — Researchers from the United Nations University World Institute for Development Economics Research (UNU-WIDER) have found that during the last four decades global income inequality decreased substantially in “relative” terms, but increased markedly in “absolute” terms. The study, published this week in the Review of Income and Wealth, shows that relative global inequality, measured by the Gini coefficient, which takes the value zero for the most equal society and one for the most unequal society (the blue line in Figure 1), has declined steadily over the past few decades, from 0.739 in 1975 to 0.631 in 2010, driven primarily by declining inequality between countries arising from the extraordinary economic growth observed in fast developing countries, such as China and India. This trend has been achieved despite an increasing trend in inequality within countries. 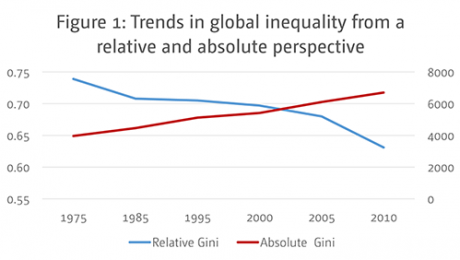 In contrast, absolute inequality, measured by the absolute Gini coefficient and depicted by the red line in Figure 1, has increased dramatically since the mid-1970s. But what’s the difference between “relative” and “absolute” measures, and which trend is more important? Finn Tarp, one of the authors of the study, explained in an interview: “Take the case of two people in Vietnam in 1986. One person had an income of US$1 a day and the other person had an income of US$10 a day. With the kind of economic growth that Vietnam has seen over the past 30 years, the first person would have now in 2016 US$8 a day while the second person, US$80 a day. So if we focus on ‘absolute’ differences, inequality has gone up, but if you focus on ‘relative’ differences, inequality between these two people would have remained the same”. The study, which employed data from UNU-WIDER’s World Income Inequality Database (WIID), also found substantially different trends in inequality across different regions of the world. For example, inequality, both relative and absolute, increased between 1975 and 2010 in North America, Europe and Central Asia, South Asia, and sub-Saharan Africa. Absolute inequality rose in Latin America, East Asia, and the Pacific, but fell according to relative inequality measures. Miguel Niño-Zarazúa, a co-author of the study, pointed out: “A critical question that arises from our analysis is whether today’s greatly increased levels of absolute inequality are inevitable at today’s per capita income levels, which have grown so substantially over the past 40 years. Our analysis found that, although average incomes in large developing countries are now much closer proportionally to those in high-income countries, the absolute gaps in income between countries are so high that even if domestic inequality was completely eliminated in all countries (which is obviously impossible) absolute inequality today would still be much higher than it was 40 years ago. Thus, while redistributive policies and investment in public goods like health and education are likely to mitigate both types of inequality, further convergence among countries would also be needed to bring global absolute inequality down to the levels seen before the recent era of globalisation”. Laurence Roope, from Oxford University, also a co-author of the study, said: “There is a view that advocates trying to reduce absolute inequality. However, there is, in our judgement, a danger in giving too much focus to reducing absolute inequality, especially in poor countries. Over the past 40 years, over one billion people around the world have been lifted out of poverty, driven largely by very substantial growth in income in countries such as China and India. This growth has been accompanied by a striking rise in absolute inequality, but it has changed the lives of many people. It is inconceivable that such growth, and the associated poverty reduction, could have occurred without an increase in absolute inequality. One interpretation of our results might be that, for better or for worse, a degree of increased absolute inequality is an inevitable by-product of economic progress. There would be huge implications for the fight against global poverty if attempts were made to halt economic growth in order to appease absolute inequality. Instead, the emphasis should be on creating more inclusive growth with falling ‘relative’ inequality — and these goals are complementary”. For interviews with authors, please contact Annett Victorero by phone (+358-(0)9-615 99237) or email (annett@wider.unu.edu).